What Needs to Happen Before We See a Big Economic Recovery? Four-and-a-half years of an overnight rate near zero and aggressive securities purchases by the Fed have succeeded in raising asset prices. The question is whether higher asset prices will deliver jobs and economic growth before they become destabilizing. In other words, will the real economy mend before excessive financial risk-taking kills the patient? With 2013′s economic data mostly complete, let’s have a look at where the race stands. 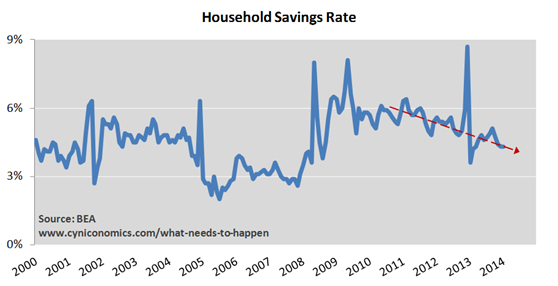 Households need to borrow at the pace we normally see in economic expansions. Household income needs to grow strongly. Of these choices, the best result would be number 2 with as little as possible of number 1. The worst would be another credit-fueled expansion (more 1 than 2) that feels good for awhile but ends badly further down the road. But isn’t capital spending the key ingredient? 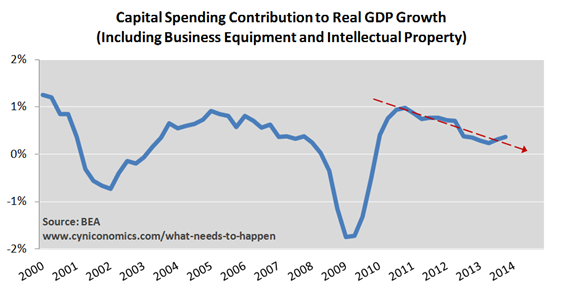 You may argue we’re missing a third possibility – a capital spending boom. Many claim this is the best way to get things going again. We would say it puts the cart before the horse, at least as far as what’s prudent and realistic. 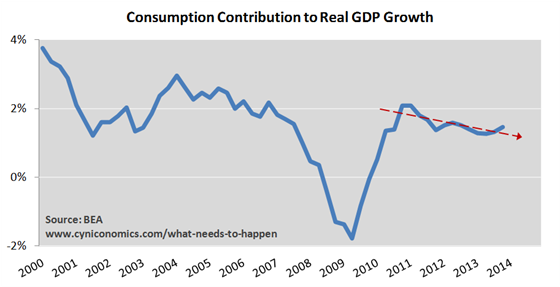 In America’s consumer-led economy, businesses have no reason to ramp up capital spending unless they expect strong gains in consumption. That seems unlikely. We’ll discuss capital spending in more detail in the future; for now, we’ll point to the economy’s ample unused capacity, tepid overseas growth, growing financial risks and President Obama’s bumbling incursions into private markets. Is this really the best environment for entrepreneurs to launch a capital spending spree? We doubt it. Okay then, how about credit growth and household income? We can’t rule out the possibility that the Fed gets the credit boom it’s looking for. But we don’t expect it in the near term for the same reasons that capital spending won’t take off, nor is it predicted by survey data. 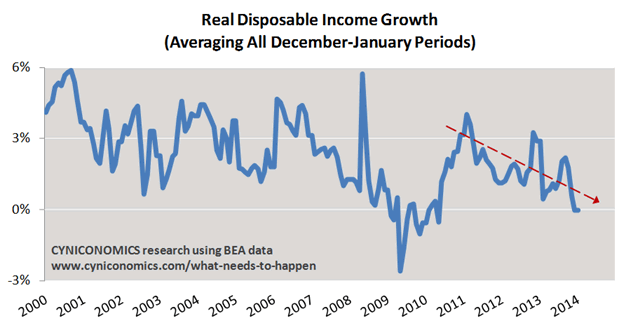 As indicated on the chart, real disposable income has been slowing for three years and currently shows no growth at all. We’ll see at least a small bounce next month, since the latest figures are held down somewhat by the 2013 increase in Social Security withholding and small increase in tax rates. There’s also a small effect from the expiration of extended unemployment benefits in January. But these considerations don’t fully explain the downwards trend. A more important factor is that new jobs are paying poorly compared to the average existing job. Employers are picking up part-timers and low-paid service workers and creating very few “breadwinner jobs.” Therefore, disposable income is much weaker than you would think if you just focus on employment growth. For all the chest-thumping from policymakers about the declining unemployment rate and increase in GDP growth in the second half of last year, these statistics are easily misread. More telling indicators, such as private domestic demand, haven’t picked up at all. Nor would you expect a robust recovery as long as employers create mostly lousy jobs. Getting back to Baum’s horse race between the real economy and the risk of financial instability, the real economy seems to be falling behind. Financial risks are growing steadily, as we discussed in “Tracking ‘Bubble Finance’ Risks in a Single Chart.” The real economy, on the other hand, is held back by weak income growth. Looking forward, it’s worth keeping an eye on the personal income reports and other indicators of employee compensation. We’ll surely see some improvement as temporary effects wash out. 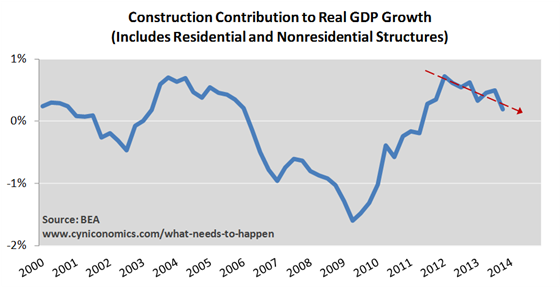 But as long as the declining trend remains intact, don’t expect the big recovery that policymakers continue to predict. For more on why employment growth isn’t as simple as Keynesian economists touting full employment targets would like you to believe, we refer readers once again to Arnold Kling’s PSST theory. Kling builds out an up-to-date variation of Joseph Schumpeter’s theory of creative destruction. He explains why creating sustainable jobs after a bust can be a very slow process.